We help our entrepreneurs’ companies grow throughout their business “life-cycle” by developing and providing a comprehensive, unparalleled array of demand-driven services and programs. At the heart of Endeavor’s innovative model is our world-class network built to support Endeavor Entrepreneurs. Once selected, entrepreneurs are provided with customized services from a volunteer network of more than a thousand global and local business leaders who serve as mentors, advisors, connectors, investors, and role models. Endeavor connects entrepreneurs with mentors who provide ongoing one-on-one support. Mentors are selected from the 3500+ active Endeavor Mentor network and are matched based on the entrepreneur’s goals, needs and interests. Mentor relationships are continuous and provide entrepreneurs with inspiration and support. Endeavor can also help create a custom advisory board comprised of Endeavor mentors. Endeavor Catalyst is an innovative rules-based, co-investment vehicle designed to support Endeavor Entrepreneurs with their equity financing rounds and contribute to the long term sustainability of Endeavor. If Endeavor Entrepreneurs are raising $5M or more and have a lead institutional investor, Endeavor Catalyst will contribute up to 10% of the financing round capped at $2M. Endeavor’s Mentor Capital Program connects entrepreneurs pursuing capital with designated mentors to support the fundraising process. These mentors typically have a strong venture capital, banking or finance background and assist entrepreneurs with honing their strategy and pitch decks. Endeavor has a strong network of investors from 100+ leading investment firms globally connected with Endeavor Entrepreneurs through tailor-made roadshows and mentoring sessions. Endeavor organizes Investor Network events three times per year for entrepreneurs to meet with members of its investor network, an invitation-only network of global venture capital and growth equity investors. Through Endeavor’s powerful network, entrepreneurs have access to markets and knowledge that can help them expand globally through a targeted and needs-based approach. 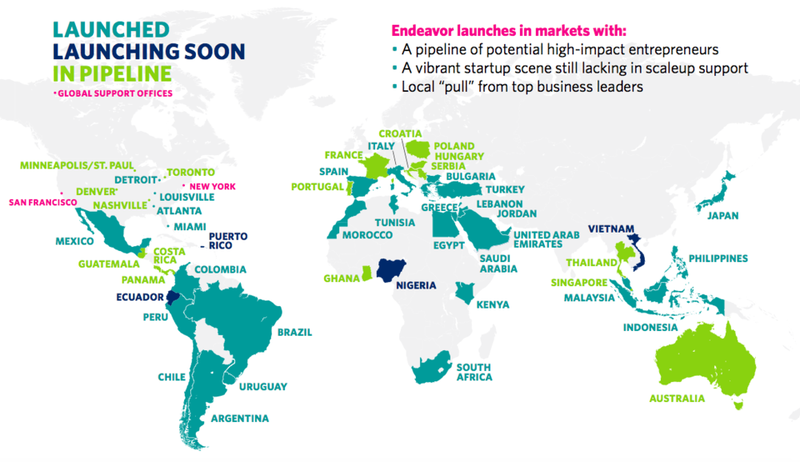 Endeavor connects entrepreneurs with mentors and fellow Endeavor Entrepreneurs in 30+ countries (and 60+ cities) where it operates. These top notch business leaders and experienced executives provide market knowledge and support on market entry strategy. Every year, Endeavor works closely with faculty at Harvard and Stanford Universities to craft a tailored curriculum for week-long educational sessions offered to Endeavor Entrepreneurs. The programs allow participants to attend classes dedicated to their business needs and to learn from world-class facilitators while connecting with likeminded entrepreneurs. Endeavor has global strategic partnerships with renowned universities who refer MBA students to work on strategic projects with Endeavor entrepreneurs as part of their elective modules. Our partnership with key consulting firms also offer an opportunity for employees to work on key strategic projects with Endeavor entrepreneurs as part of their internship / performance management programs. Along with with Endeavor’s eMBA Fellows program, teams of top second-year MIT Sloan MBA students deliver insight and analysis to Endeavor Entrepreneurs around the world. They help provide solutions to business problems in critical areas such as strategic growth, new market entry, human resources, marketing, financial modeling and more.